My name is Betty Housey and I am the sole owner of Mystery@Large. I was born in Milwaukee, Wisconsin one of two girls. I’ve always wanted to write mysteries. I’d save my pennies until I had a dollar and then run the twenty blocks to Schuster’s to buy the latest Nancy Drew book. I bet I read each book at leas ten times. I have two children, my daughter lives in Denver Colorado with her beloved cat, Pooty, and my son in Beijing China with his beautiful wife Xiuli. I now live in Coral Springs, Florida with my husband and my second beloved Chihuahua. My husband wishes to move but I’ve become a tropical girl. I’ve professionally published three books and one short story, but I’ve written many more. I’ve been busy resurrecting my first set of characters and with amazing speed have completed three books. I love these characters. 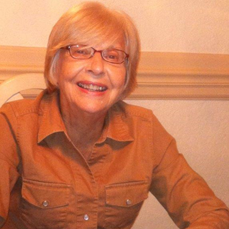 I am a founding member of the Coral Springs Writers’ Group. As they haven’t had a chance to critique the latest book, I’m enjoying writing that book immensely. I love my characters. They are always in my head. And I write for them when I’m not planning to. I’ve written whole scenes, swimming in the pool. I usually have two or three chapters in my head when I sit down to write. I don’t outline the whole book as my characters may take me in different directions. I listen to my characters. They will lead me where they want to go. Do what works best for you. Some writers must have a detailed outline before they can began writing. I’ve written last chapters when only half way through the book. It is now hard to get a publisher. I decided on this last set of books to go self publishing. If an established firm would want to pick them up, so be it. It is getting harder and harder to go the standard route. I think most books in the future will be self published. I stick to mysteries and magic.